Microbial assessment was carried out monthly during 2003 at four fish farms, in addition to Dayer El-Berka Drain (the source of water for the farms) in El-Fayoum. This study investigated the bacterial indicators of pollution, the bacterial bioniass and the bacteria associated with nitrogen transformations in the aquatic ecosystem of the fish farms. The data showed that the temperature ranged between 16.6 llC and 33.6 °C and the pH values were at the alkaline side (7.43- 8.91}. On the other hand, the concentrations of ammonia, nitrite and nitrate were in the range of 0.2- 2.26 mg/L 2.7- 96 jig/I and 26.3- 300.3 (ig/1, respectively.The bacteriological analyses revealed that the variation in the total viable bacterial counts in the farms was directly related to the type of diet used in fish nutrition. The bacterial counts, in the fish farms, varied from 1.8 x 1012 to 40.8 * 1012 cfu /ml and from 1.4 * 1012 to 151012 cfu /ml at 22 °C and 37 °C respectively. On the other hand, their counts in Dayer Et-Berka Drain fluctuated between 2.8 * 1012 and 29 * 1012 cfu/ml and between 4 x 1012 and 30 * 1012 cfu /ml at 22 °C and 37°C, respectively. Whereas the bacterio-plankton biomass ranged between 496 * 10 and 1160 * 10J mg C m"3. The present data showed that the bacterial flora was markedly affected by water temperature. 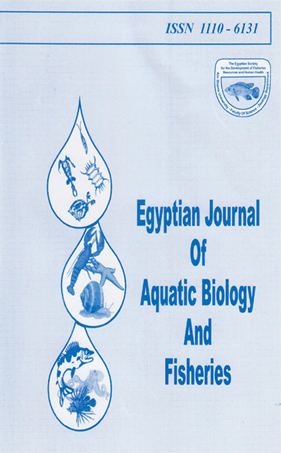 Bacteriological examination showed that the highest counts of nitrogen cycle bacteria recorded in Dayer El-Berka Drain was high compared with the fish ponds. With regard to the bacterial pollution, the results revealed that the numbers of faecal indicator bacteria, in Dayer El-Berka Drain exceeded the Egyptian standards (1996) and the European Commission (EC) guide standards (1998). Thus, for public health concern, the drainage water should be treated before being used in aquaculture.